Homemade Flour Tortillas! They’re super easy and require just a few pantry staples. Give them a shot next time you rock some tacos at home. It’s Saturday, and it’s officially Spring! If that’s not good news, then I don’t know what is. Earlier this week, I took my laptop and morning coffee out to the covered patio with Tilly. We enjoyed some much needed fresh air and serenity. This new backyard of ours is such an escape and I am so so grateful for it. My favorite thing about this neighborhood is the calmness of it. In the morning and throughout the day, we’re greeted by various bird chirps. In the evening, we’re treated to the conversations of crickets and toads, and the intoxicating smell of campfires lingering in the air. I couldn’t ask for more. With this extra bounce in my step, I’m really looking forward to tearing up our backyard to get a vegetable garden going. I’m also looking forward to hitting the town market and playing with some of the beautiful local produce folks have to offer. I’m so ready for the shift to bright and fresh flavors, which is exactly why I decided to rock some blackened shrimp tacos with a refreshing pineapple salsa earlier this week. But first! I’ve been eager to learn how to make flour tortillas. And after several successful attempts, I wanted to bring these fluffy and chewy gems to you. Like most things from-scratch, they’re so much better than store-bought. I totally get that zipping by the grocery store is easier some nights. But if you’re ever in the mood to try your hand at homemade flour tortillas, I hope you’ll give these bad boys a whirl. They’re incredibly easy and call for simple pantry ingredients. If you have a tortilla press, awesome. If you don’t, there are ways around this that I’ll pop into my recipe notes. Looking for some scrumptious taco recipes to fill these beauties? Try my quick weeknight-friendly Instant Pot Ground Turkey Tacos or my Shrimp Tacos With Mango Habanero Salsa! Homemade Flour Tortillas! They're super easy and require just a few pantry staples. Give them a shot next time you rock some tacos at home. To make the tacos (same instructions for both sizes). In a large bowl, whisk together the flour, salt, and baking powder. With clean hands, mix in the cold butter, crumbling it well with your fingers, until the flour somewhat resembles cornmeal. Add the hot water and mix the contents in the bowl until a dough comes together. Transfer the dough to a lightly floured surface and knead it for a few minutes, or until it's smooth and elastic. Divide the dough into 8 equal parts and roll each piece into a ball. Preheat a large skillet over medium-high heat. (I find that a well-seasoned cast iron skillet works best.) If you're using a tortilla press, place the cut open freezer bag onto the press, opened, so that half of it is covering the bottom of the press and the other half, the top. Place one of the dough balls onto the bottom surface of the press and bring the press down, pressing it tightly. Lift the press, and carefully remove the now flattened tortilla round from the plastic. Place it in the hot skillet and warm it through for about 1 minute each side, or until each side is golden brown. (Time may vary with different pans and stovetops, so always judge by the golden color.) When done, remove the tortilla and place it in a tinfoil pack or wrap it with a clean dish towel to keep warm. Repeat with the rest of the dough balls. If you don't have a tortilla press, you can use a heavy baking dish. Simply place the dough ball on a floured surface, cover with a freezer bag, and press the baking dish down onto the flour ball. This takes a lot more force than a tortilla press, but it can work in the same manner. Use the warm tortillas within a few hours for best results, or refrigerate up to three (3) days. Using the plastic freezer bag seems to work best when it comes to preventing the dough from sticking to the press surface. I'm trying to minimize my use of plastic, so I have a freezer bag that I reuse for making tortillas. Plastic wrap doesn't work as well since it bunches up too easily. If you want to avoid plastic all together, you could try flouring your press surfaces, just be sure to not over flour. I love making homemade tortillas. They take Taco Tuesday to the next level! (But, let's be real, tacos happen over here more than Taco Tuesday...I can never restrict that deliciousness to one day of the week.) Your detailed tutorial is great--love the kneading action shot. Bookmarking this post to try your recipe over the weekend! I am so into this! I have a tortilla press and love making corn tortillas, but haven't ventured into flour tortilla land yet. Maybe I was just waiting for this awesome recipe to come along? 😉They look so fluffy and chewy and would be so perfect with some beans and fresh salsa. A must try! Corn tortillas are next on my list! Taco taco maaaaan. I want to be, a taco man. Actually I already consider myself a taco man. That being said, while I've made many a corn tortilla, I have yet to tackle flour, and I'm impressed to see how easy it is!! I'm kinda tempted to try lard myself, but I can't get my hands on that as easily as I can butter, so it's nice to see that butter will yield such spectacular results. Thanks for sharing Dana! DIY+Tacos for life! Lard is definitely the classic ingredient, so go nuts! I was just happy to see that butter worked. I never use lard, so to have it in my house just for this seemed like a waste. Plus, nice to have a vegetarian-friendly recipe. Kill two birds with one… okay, not a very veg-friendly idiom. But you know what I mean. Haha. I find it's always worth the little extra time and effort to make the typical packaged foods ourselves. We personally haven't bought tortillas in over two years because of this same recipe. I love that you included the different amounts for large and small tacos. You can't go wrong with homemade. Also... beautiful photos! Thanks, Phil! And I'm with you 100%. I love that you haven't bought tortillas in so long. I'm like that with a few things (salad dressing, guac, hummus… ) now adding tortillas to that list. I totally agree that homemade is best! These tortillas came out perfectly and just in time for Cinco de Mayo! We love Mexican flavors so I can think of a ton of fillings for these perfect tortillas and can't wait to get started. Now I need to go check out your suggestions! You're so right. The difference between store bought and homemade is priceless. We eat tacos multiple times a week so I can't believe I have never tried to make my own? Curious. I also like to use tortillas cut in strips and baked for taco salad. This could easily be on repeat at my house. Ouuu, I love your idea of making homemade taco strips for salads! I'm going to have to do that. I'd also love to make my own little tortilla chips. Our to-make lists are never ending, aren't they? 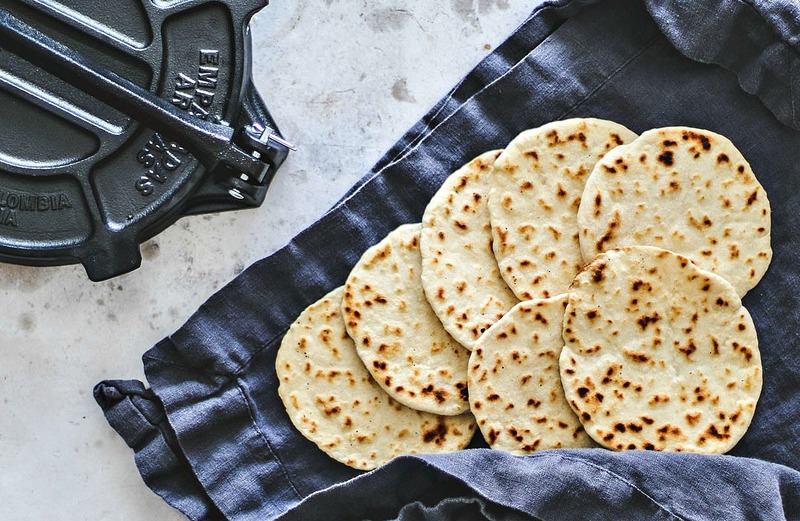 Who knew making flour tortillas at home was so easy? The tortilla press I bought a couple of years ago has been gathering dust in a drawer, but I'm definitely put it to work this weekend on these delicious tortillas. Great recipe! I have a few kitchen gadgets gathering dust. The guilt is real! Homemade tortillas are the BEST. I have made corn tortillas, but have yet to make ones from flour. Love that tortilla press, I have the same one. Works like a charm. I really do love this press! Corn tortillas are next. I can't wait to give them a go.